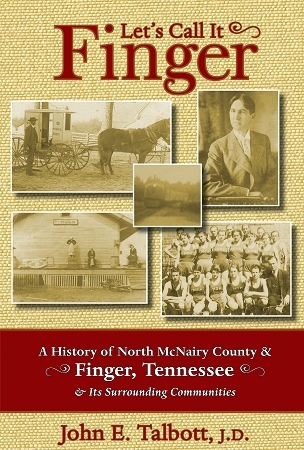 Let’s Call It Finger is the story of north McNairy County, Tennessee, in and around the small West Tennessee town of Finger from its early settlement to World War II. Great emphasis is placed on the general development of north McNairy County from the 1820s to 1900. The story shifts to the establishment of Finger in 1900 through the post-war era, including the area’s settlement, the War Between the States and its effects, and the advancement of education, business and commerce, transportation, and medicine. Strange, peculiar, and interesting events are also discussed, as well as the people and happenings that left indelible marks on Finger and north McNairy County. Finally, tribute is paid to the dead of the area with the inclusion of up-to-date histories and censuses of some twenty-five local cemeteries that document the graves of more than 2,700 individuals. While no other work exists on this scale and to this extent, author John E. Talbott puts forth this work with hopes that it will assist future generations in their quest to chronicle their families and the history of the region.